Update, May 21: Fortnite’s jetpacks will hit the game tomorrow in a new content update. Continuing Epic’s apparent tradition of suddenly announcing and releasing new content for Fortnite, today has seen jetpacks unofficially leak, then get announced via an in-game message, and now they’re officially confirmed via the Fortnite Twitter. The content update for 4.2 will launch May 22 at 5:00 PDT / 8:00 EDT / 12:00 GMT. There’ll be no downtime, so once the update is live you’re free to get flying. Update, May 21: Fortnite’s jetpacks are just around the corner. Jetpacks have returned to Fortnite’s ‘new updates’ section, suggesting that the items will be available in-game in the very near future. The message states that the Jetpacks will only be available for a limited time, making it the first item to be made available exclusively for a Limited Time Mode. It’s likely that the Jetpack, and its new mode, will arrive later this week, in tie for the weekend. It is possible that it’ll arrive tomorrow instead, alongside the Fortnite week 4 challenges, but that would be a quick turnaround, even by Epic’s standards. Original story, May 21: Fortnite’s jetpack could finally release as early as next week. The item was revealed by Epic several months ago, but was soon postponed, and we’ve heard barely anything about it since. That’s despite the release of multiple new weapons and gadgets during the final weeks of season three, and even the release of season 4. Now, however, we might finally get our first in-game look at the Fortnite Jetpack, as a recent datamine seems to have uncovered information suggesting the item will be available in-game before the beginning of week 5 of season 4. 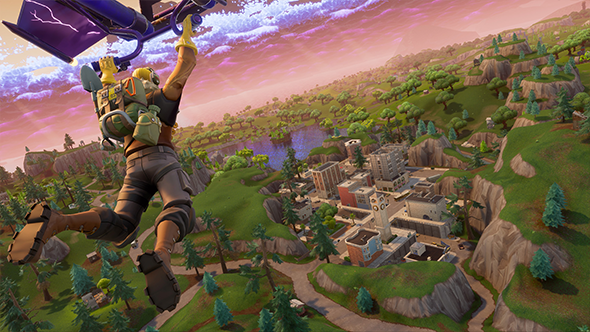 If you care to cast your minds back to February, you’ll remember thatFortnite’s jetpackappeared in the game’s latest updates section, stating that the item, which allowed you to “take the flight to all new heights,” was coming soon. A little over a week later, however, Epic released a video onTwitterin which systems designer Eric Williamson says that internal playtests “identified some issues” with the Jetpack, and little has been heard since. Until now. That suggests that we could see the Jetpack added to the game during Season 4 Week 5, if not before. Do bear in mind, however, that data files can change, and it could still be a while before you can take to the skies (although you could always just scoff a load of Hop Rocks to gain some extra lift).